Following on from yesterday’s countdown from 10 to 5, here are our picks for the top 5 BTCC drivers of 2015 . Six podiums, including one race victory at Thruxton back in the Spring represents a fine haul of results for Morgan and the WIX Racing Mercedes in 2015. Equalling a career best finish of 7th in the Championship, Morgan proved his abilities once again and showed he is more than capable of fighting it out with the star names of the BTCC. An ever present in the top ten this season, Ciceley Racing will have high hopes for even more success in 2016. BTCC stalwart Neal enjoyed another successful campaign, this time in the all new Civic Type-R which Honda Racing only received weeks before Brands Hatch Indy back in March. Although not able to match Shedden on either ultimate pace and consistency in 2015, a fine haul of three race wins and seven podiums (including taking victory at the new Civic’s first ever race weekend) represents another successful year for this BTCC veteran who finished 2015 third in the table. We placed Jordan higher than Matt Neal on our list because finishing 5th in the standings, in what was a less than vintage year for Triple Eight can be seen as a huge achievement for the 2013 Champ. Despite not having taken a race victory since Croft 2014, Jordan’s sheer consistency propelled him to 5th in the standings, finishing inside the top ten in all but 8 races in 2015. With a move to Motorbase and the Ford Focus for 2016, who knows what Jordan could achieve when placed in race winning machinery once again. Another season, and another 2nd place in the Championship for JP can only leave the BMR driver with a sour taste in his mouth. Before race three at Brands Hatch, Plato looked likely to take his third BTCC title until Shedden’s masterful drive through the field took all the glory away from Plato’s race three victory. Once again over the course of a season, Plato proved just why he is the BTCC’s all time most successful driver (in terms of wins) and would have been a equally worthy champion. You can argue the case that luck did not seem to be on Team BMR’s side in 2015, however if they can continue improving the Volkswagen Passatt during the winter break, you can definitely place your money on Plato and BMW being right back at the front again in 2016. Like or loathe Team Dynamics, you have it hand it to both Gordon Shedden and Honda Racing in 2015. Truth be told, although his superb consistency over the course of 30 races gave Shedden the upper hand in the title race, his awe inspiring drive from the back of the field in race 30 to take the Championship would have given the likable Scot first place on our list, no matter what. With so much at stake, Shedden’s composure, determination and incredible overtaking prowess proved that he is a thoroughly deserving BTCC champion (we don’t think anyone can argue with that). 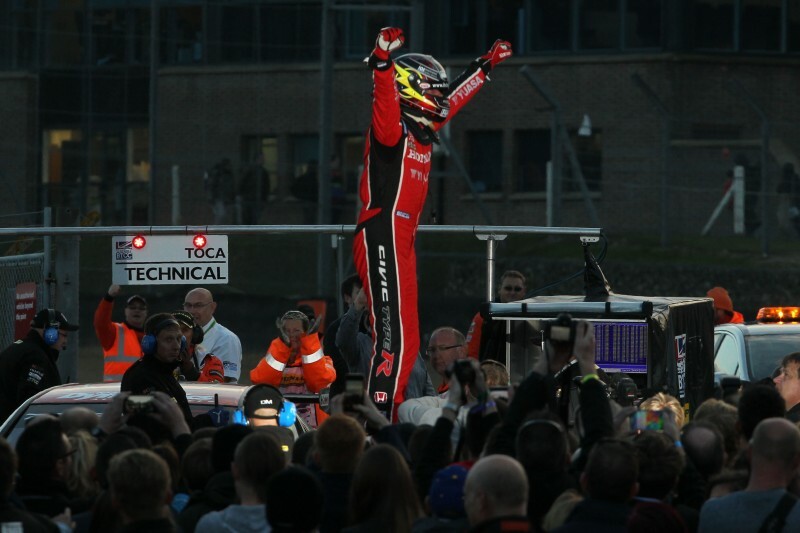 With four race victories and 11 podium finishes 2015 will be a year to remember for Gordon Shedden and we can look forward to Brands Hatch Indy in Spring 2016 where all of the drivers in our top 10 list will take to the grid once more. Jack Goff – A well deserved and long awaited first BTCC victory at Snetterton, Triple Eight’s only one of the year. Previous articleOur Top 10 Drivers of the BTCC season part one….